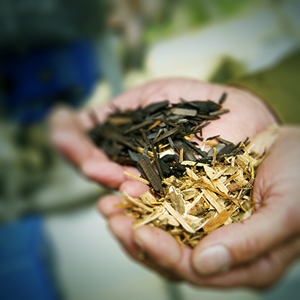 The Biomass Research and Development Initiative (BRDI) is a collaborative effort between the Department of Energy and the U.S. Department of Agriculture that supports renewable energy research in the rural United States. In 2015, BRDI funded Waste to Wisdom, a research project led by Humboldt State University, studying the conversion of forest residues into renewable energy and other valuable bio-based products. There are approximately 68 million dry tons of forest residues produced during traditional logging and land-clearing operations each year. There aer 28 million acres of National Forest lands in the western U.S. that are characterized as having unnatural or excessive amounts of woody vegetation, which could produce additional residues during fuel reduction thinning and restoration operations. The overall project proposes technologies for production of bioenergy and high value bioproducts from utilization of forest residue. Further, the project proposes reduction of net greenhouse gas emissions, and promotes economic development and sustainability in rural, forestry-dependent communities. It is expected that efficient use of forest residues utilizing well-established infrastructure in the forestry sector will result in net positive benefits for rural communities while promoting environmental sustainability. The proposed project encompasses forest residue collection, conversion, and transportation for gasification, pyrolysis, and densification pathways. The University of Washington will be responsible for three major components of the project: (1) developing cradle-to-gate life cycle analyses (LCA) for forest collection processes, (2) based on inputs from other TA-3 participants compare footprints for the biomass conversion technologies in order to determine environmental footprints on a comparable functional unit basis and (3) conducting economic viability analysis and of the proposed technologies and marketing analysis of the associated products to determine the short- and long-term economic success of the technology. First we will develop a spatial analysis of federal lands and their potential contribution for biochar feedstocks for the 11 contiguous western states (California, Oregon, Washington, Idaho, Montana, Wyoming, Nevada, Utah, New Mexico, Arizona and Colorado). This analysis will build on prior work (Oneil and McCarter, in prep) that assessed the impacts of fire and management on carbon stocks and emissions from these same states and link them in a spatially explicit analysis of supply that can be used to support rural economic development. It also builds on the GIS capability for analysis and integrated database approach developed in the Washington State Biomass Supply Project (Perez-Garcia et al 2012). We will start by aggregating and cleaning data on current and historic fire and insect impacts and integrating them into a seamless GIS data format. Contingent on reaching a data sharing agreement with the USFS on the use of FIA coordinates, we will use the fire and insect maps from the GIS analysis to exclude FIA plots that have been killed by fire and/or insects and disease since the last inventory update. This step will allow us to aggregate, and simulate only those forest inventory plots that are still potentially available for treatments that can support biomass utilization. The simulations can be conducted with and without fire impacts to assess the relative emissions associated with leaving the forests to burn or conducting restoration activities that produce biochar. Using the simulations and proposed/potential forest operations that are found to be technically and commercially viable from TA-1 and TA-2, we expect to be able to identify the likely carbon consequences of the biochar application relative to alternative management scenarios. Linking the spatial analysis to the carbon accounting will be a substantial advancement of prior work and provides a robust framework for assessing the sustainability of the proposed technologies when applied to the specific conditions found in western US forest lands, and particularly on federal lands in the 11 western (contiguous) states.